The perfect addition to the office of any busy tax pro! 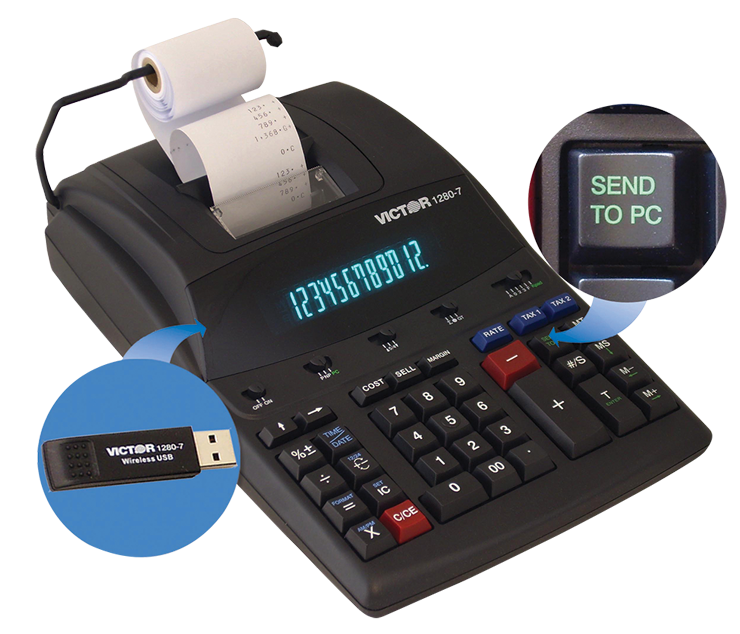 The Victor 12-digit calculator is great for the everyday advanced user. Features an extra large, fluorescent display for easy viewing. Optional Print-to-PC mode creates paperless tape in your spreadsheet. SEND key relays a single calculation wirelessly to any application on your PC. Keypad mode converts calculator to a wireless keypad. Fast and reliable 4.6 lines-per-second ribbon printer. Cost/sell/margin keys make for quick and easy profit margin calculations. Manufactured with 45% recycled plastic. For our 14-digit calculator option, see product #902. I purchased this adding machine 4 years ago and it still works great. The "Send to PC" feature is fantastic. If you've ever added up a ton of medical receipts for Sch A or repair invoices for Sch E this is the machine for you. Once click and the total goes right to the tax return! The only flaw is that every month or so I lose the wireless connection between the machine and my PC. Resetting it takes only a minute, however.